We chose to use polyethylene (PE) netting for our backyard "Family Special". Why did we choose Polyethylene for this package? 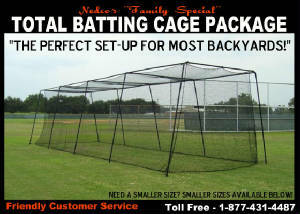 Family's have a need for a batting cage that is durable and that will last them at least 5 years. PE netting does not absorb water. This prevents the net from becoming saturated with moisture. This saturation can possibly causes the net to become heavy, sag and possibly stretch. This heavy weight can also cause the cage frame to stress. After three years of outdoor exposure, PE netting retains a higher tensile strength than nylon. PE holds up well under direct sun. PE is more economical than nylon. Most family's are looking to buy the absolute best product they can for the absolute best price. The PE product offers our customers the best price and perfromance for the dollar! Our batting cage netting also features a heavy rope border along the bottom, corners, and top ribs. In the Southern regions of the U.S. and and especially along the coast, high heat and humidity shortens the life span of nylon netting, even when it is treated. Our easy-to-assemble frames. Made with 1.5" round steel tubing. Powder-coated black finish to resist rusting. Our nets feqature braided mesh. Braided mesh absorbs ball contact over a larger area, thus prolonging the life of the netting. Our nets come in the two net sizes shown below. Click on the image for a larger view. 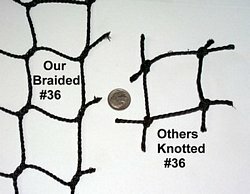 Our standard #36 netting is UV treated. This economical 2.5mm braided poly batting cage netting is best for recreational and high school use. It's a much better choice than competitors' standard #21 knotted batting cage netting. Braided mesh absorbs ball contact over a larger area, thus prolonging the life of the netting. This 2.8mm heavy-duty netting is suitable for professional and collegiate teams. UV treated. It is hung on the square, insuring easy installation and a nice clean look. These are our best selling batting cage nets for high school, colleges and baseball schools because they are reasonably priced and hold up extremely well under demanding practices and exposure to conditions.